As mentioned in the introduction to Western Region diesel - hydraulic locomotives, Swindon engineers began designing their own lightweight version of a Type 4 diesel - hydraulic locomotive after the British Transport Commission placed the order for D600 - 4 with the North British Locomotive Company. Taken from the design of the Krauss - Maffei V200 machine, the WR faced considerable problems in adapting the design to the British loading gauge which was 10 inches lower and 16 inches narrower than the German locomotive. Within this reduced body, the same engine and transmission sets as the V200 had to be accommodated and these later 'Warships' were notorious for their cramped space within the engine compartment. Using stressed - skin construction with thin metal plates forming the sides and roof of the body, and steel tubes running the full length of the locomotive acting as the main members, total weight was kept under 80 tons. 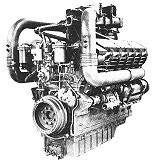 Maybach MD650 engines of 1,035 bhp each were coupled to Mekydro K104U four speed transmissions. The bogies were developed from the German design. In January 1956, the BTC allowed the Western Region to build three pilot D800 'Warships' numbered D800 - 2 and later named Sir Brian Robertson, Vanguard and Formidable respectively. Then in February 1957, over a year before the first members were built, a further order of 30 D800s was given to Swindon. The main difference with this batch was that the Maybach engines were uprated to 1,135 bhp each, except for number D830 which employed Paxman 12YJX engines, though again of 1,135 bhp. During July 1958, while number D800 was undergoing trials prior to entering into traffic, a further order for 33 D800s was given, this time to NBL. Numbered D833 - 65, these locomotives would use the same MAN L12V18/21B engines of 1,100 bhp and Voith LT306r transmissions as fitted in the earlier D6300 class. All of the engines and 13 of the 33 sets of transmissions would be built by NBL. The last batch of 'Warship' orders was given to Swindon in April 1959 but only for five locomotives. These last five did create problems for locomotives names carried by the class. Similar to the D600 'Warships', the D800 'Warships' were named in alphabetical order from the first of the production engines, number D803 Albion. It was expected that the final number of the class would be D865 and this locomotive was to named Zenith. When the order for D866 - 70 was received, Swindon then had to find another five warship names begining with the letter 'Z'. To ease the situation numbers D864/5 had their names changed to maintain the alphabetical order. The only exception to this alphabetical system was D812 The Royal Naval Reserve 1859 - 1959, which commemorated the centenary of the reserve. All members of the class were delivered in the standard BR green livery with a white stripe at waist height along the body sides, however numbers D859 - 65 were delivered with a small yellow panel around the headcodes. Number D800 entered service in August 1958 and all 'Warships' began their working lives almost exclusively on passenger trains as their low weight for braking hindered their use on loose - coupled freight trains. Confined mainly to the Paddington to Bristol and Paddington to Penzance routes, they were rarely seen north of Bristol until 1962. Teething troubles were soon experienced with the train heating boiler due mainly to a lack of ventilation. NBL built 'Warships' incorporated a set of ventilation grilles cut in the roof panel above the boiler and Swindon built locomotives were altered to a similar design. Engine temperature relays were also modified. Previously, when engine temperature rose to 90°C, the relays would shut down the engine. The relays were altered so that the engine would be set to idling in the event of overheating. One major problem that was quickly realised was the unsatisfactory riding qualities of the locomotives above 80 mph. This was due to the Western Region copying the German design of the bogies and although the Krauss - Maffei V200s did not suffer from the fault, it was found that these locomotives seldom worked above 75 mph. A speed restriction of 80 mph was applied to the class while engineers performed various trials on the bogies. After many months, the D800 bogie was completely redesigned with an addition of hydraulic dampers. This same modification however was also introduced onto the D1000 'Western' locomotives as these also utilised the German design of bogie. One complication of the 'Warship' class was the use of two different engines and transmissions. The Maybach and MAN engines were interchangable as far as mountings and connections were concerned, but the Mekydro and Voith transmissions were not. 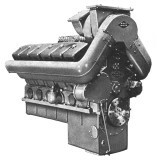 In service, the Maybach engines gave greater power and reliability between overhauls than the MAN engines. Average milages in the early lives of the 'Warships' was between 80,000 and 96,000 miles per year, although this dropped to 50,000 miles per annum in later years. Frequent problems with the MAN engines of the NBL built 'Warships' produced a move away from passenger to freight duties, and additionally, the closure of NBL meant a shortage of spares for these engines and Voith transmissions. Meanwhile, the Swindon built locomotives regularly double - headed the 'Cornish Riviera Express' and the 'Torbay Express'. The death knell for the diesel - hydraulic locomotive was rung with the publication of the National Traction Plan in 1967. It called for some order to be resumed to the chaotic locomotive fleet as ordered by the BTC. Classes which were expensive to maintain or those of small numbers would be withdrawn. Of the 2,976 main line diesel engine locomotives in use at that time, just 309 were diesel - hydraulics. The first three 'Warships', D800 - 2, were the first casualties in 1968 as they differed in several respects from the other members of the class. During 1969, D830 was withdrawn due to the isolated use of its Paxman engines, together with D840, D848 and D863, however, there then followed a period of locomotive shortages and this produced a reprieve for the class for almost two years. Consequently, 1971 saw the greatest number of 'Warships' withdrawn and by the end of the year no less than 45 members of the class were scrapped. This comprised of all of the NBL built 'Warships' and 15 of the Swindon built locomotives. January 1972 saw another nine 'Warships' withdrawn, but again, locomotive shortages returned three of these back into traffic. These 13 survivors were by now in appalling external condition and several ran without nameplates, however by the end of the year these 'Warships' were withdrawn with D832 Onslaught having the honour of being the last 'Warship' in service. 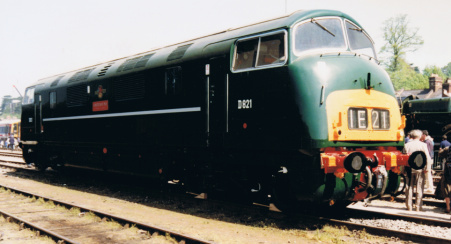 As the last working member, D832 Onslaught, was purchased by a group for preservation on the East Lancs Railway. Previous to this, the North Yorkshire Moors Railway bought D821 Greyhound . The other 'Warship' to escape the cutters torch on withdrawal was D818 Glory. Displayed at Swindon as a static exhibit, her exterior condition grew worse with time and she was finally cut up in 1985. However, several of her parts were bought as spares for the other 'Warship' survivors.